This bike is a modification of the 8291 Dirt Bike. Is inspired in the color scheme of the 8838 Shock Cycle and a Wasp (insect). It´s basically the 8291 frame and engine but with black "Technic Pin Long with Friction" instead of blue ones. The swing arm is longer than the original in order to accommodate the bigger wheels, from set 8051 Motorbike or 7158 Furno Bike. The front and back suspension are also lowered. One of the main features of this mod is an Black Excavator Bucket Part 2950 used as fuel tank, and the frame stickers from the set 8414-1: Mountain Rambler. The credits for the "inner shocks" is for legopaede, I have seen this ideia in one of his bikes and since then I wanted to try it out. 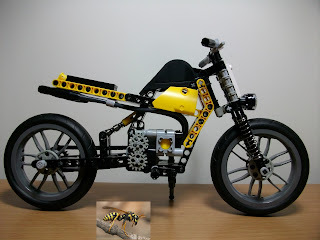 You can see more photos and "about" the bike in kurtSoares MocPages or Brickshelf page.